The amount of registered pups in the SV-breeding book has dropped in merely 15 years from 34.685 pups in the year 1993, to approximately 16.816 pups in 2007. A scary development indeed. The battle for stud fees increases. Now as before,the stud business is being controlled by only a few males and their owners, those that always occupy the first positions at the exhibitions and have made a name for themselves in the Siegershow. Apparently people seem to want to breed solely to the very best, it needs to be "Vorzüglich Auslese" (VA), at least not much less. So the cake is being shared by only a few “Ausleser”. Does the breed benefit from this? Should we not spread the genes? Should not the broad blood basis be used to the fullest? According to SV-information, in 2007 we had 1.259 different studs at our disposal. Sadly enough, most of them will only be used once. Their stud fees might only bring their owners a mere 400 Euro. For this amount, one will not get the services of the top-males listed in my latest study. You will need a thousand Euros for their services, unless you belong to the club. But that is another story altogether. 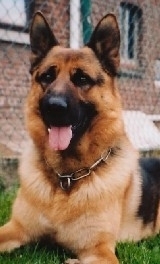 I wish you all a healthy GSD!